In this watercolour workshop you will have the opportunity to work with accomplished watercolorist, Clive Powsey. This workshop will explore two aspects of watercolour; glazing with transparent colour and mixing alla prima (wet on wet). 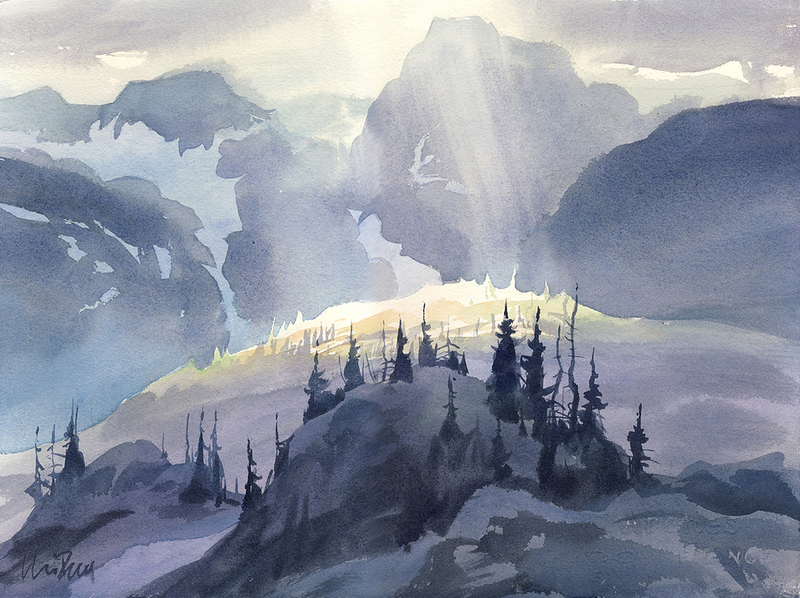 You will likely paint two watercolours over the day depending on how quick you are. We will start with a monochrome grisaille landscape paying careful attention to the effect of light and shade on topography and ignoring local colour. Subsequently local colour will be glazed onto the painting bringing together the full effect of light and shade, local colour, and texture. Subsequent watercolours might use the same approach or be looser, wetter and more ‘alla prima’. Nevertheless, we will continue to try and pay attention to dividing the landscape into areas of light and shade. As a result of these experiments you will learn about rendering form in paint and will be particularly aware of some of watercolours unique strengths. You will be able to repeat the concepts behind these painting exercises at home using similar subject matter. We have some aprons, but wear clothes that can withstand the elements (i.e. glue, paint, etc.) of a fun, creative art studio. Nothing else is required. Bring your own preferred paints, paper and brushes if you like, but it is not required. Clive Powsey graduated from The Ontario College of Art in 1980. He has been exhibiting regularly since in public and commercial galleries. He also worked for 30 years as a layout artist, background artist and art director in animated film, advertising and television for companies including Nelvana and Disney. In 1991 he participated in Open Waters, a group show of the Canadian Society of Painters in Watercolour, The Royal Watercolour Society, and The American Watercolour Society that travelled to Toronto, New York, and London. He is a painter, award winning watercolourist, delineator, traditional printmaker and psychotopographer of form. He has taught drawing and painting at The Ontario College of Art and Max the Mutt Animation School in Toronto and currently teaches courses in drawing and introductory design in North Island College’s Metal Jewellery Design Program in Campbell River.